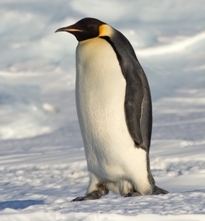 In what is some of the crappiest news I’ve read today, scientists have discovered previously unknown colonies of emperor Penguins in the Antarctic. Before you ask, I don’t think the news is crappy because I hate penguins. I actually like those goofy flightless fish-eaters. The news is crappy because the penguin colonies were discovered via satellite imaging of penguin poop trails. While penguins themselves aren’t visible from space, scientists are able to pick out the reddish-brown droppings against the white sheets of ice, and they use the latrine trail to track the movement of the birds. This has to be one of the strangest penguin-related stories since Pierre the Penguin got his designer coat! It’s great that they’ve figured out a better way to track the birds, but that’s really kind of a strange thing to issue a press release about. I wonder how they A) discovered they could see penguin doo-doo from space and B) who figured out that it WAS penguin remains they were tracking across the ice.